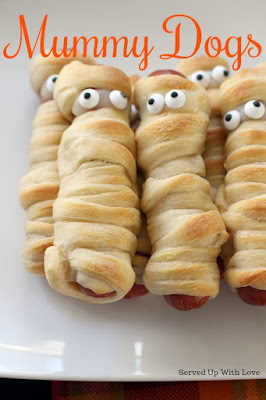 Are you hosting any Halloween parties this year? Growing up I always went to my friends church that hosted a Halloween party for all the kids. It was always fun and games and lots of yummy treats to eat. You can bet there was always some fun Halloween inspired foods, especially the punch! This Witches Brew is a must make for all the ghost and goblins at the party. Many years ago (gasp) when our son was younger we co-hosted a Halloween party at my good friends house. She was quite the planner and had it all laid out perfectly to make sure all the kids had fun. A bunch of the adults dressed up and were set up at different stations to help to scare the kids. Of course, I was the witch!! I had my cauldron in front of me and as I stirred the pot I would let out my most evil laugh. I have to admit, I really LOVED doing it! AND I was quite convincing to those kids. It was so fun to see them try to figure out who we were. It was the absolute best Halloween party. Everyone loved it! To this day, our 20 year old will bring it up and make me do that evil laugh. Yes, I can still do it perfectly!! It was the absolute best Halloween party. Everyone loved it! To this day, our 20 year old will bring it up and make me do that evil laugh. Yes, I can still do it perfectly!! You want to see my broom? 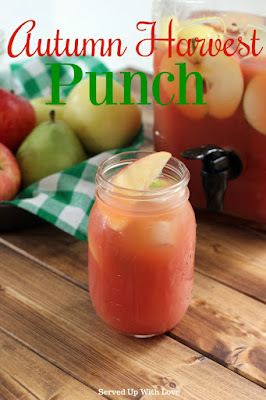 Since our normal go-to punch recipe for birthday parties involves 2 simple ingredients I knew another version would be the perfect Witches Brew for Halloween. Throw in some gummy worms, eyeballs, spider rings, or anything that a witch would throw into her cauldron. If you want to go just one step further, freeze these in ice cubes. How fun would that be? If you add anything not edible, please make sure you are not serving to young children under the age of 5. 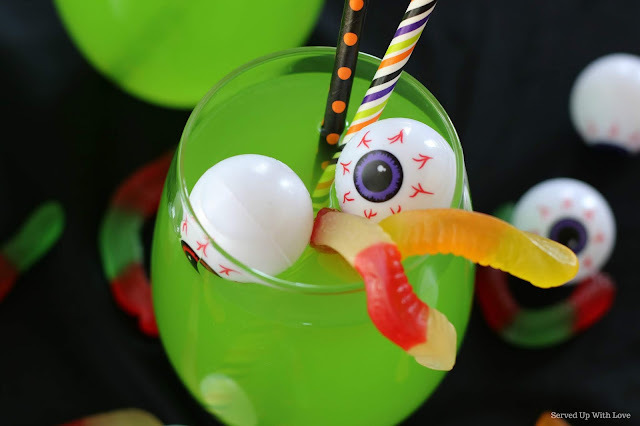 A fun Halloween party punch kids of all ages will enjoy! 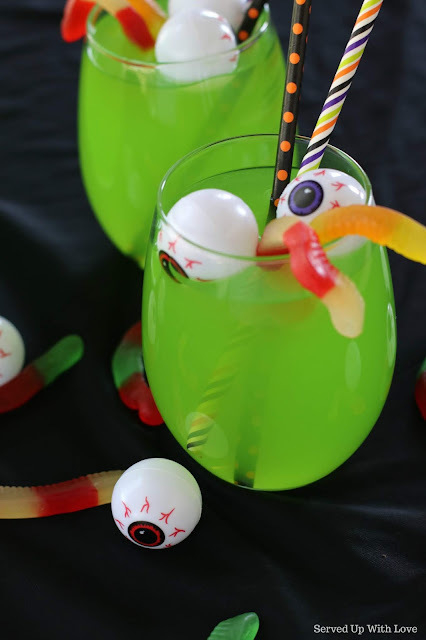 Gummy worms, eye balls, spider rings, etc. In a punch bowl or large drink dispenser, pour in the green juice and the lemon-lime soda. Give it a stir. 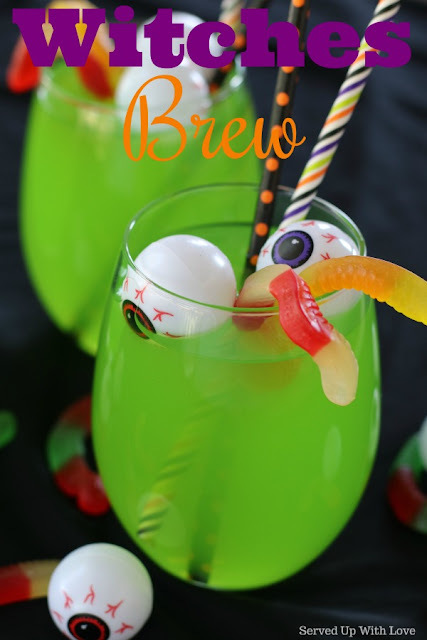 Pour in a glass and add gummy worms or anything that would be fun and spooky. (eyeballs, plastic spiders, etc - as long as the kids know not to eat the toys) It is really just for fun!